The first two Graduales were written as interludes between the different parts of the Missa Prolationum of Johannes Ockeghem (ca.1410/30-1497) — an example of strict canon writing from the Renaissance Franco-Flemish school. The title Graduale refers to a missing Mass movement in Ockeghem's work — and to the minor-scale (‘gradus’ meaning scale in Latin) on which both Graduale 1 and 2 are built. The first two Graduales use the principle of change ringing: a maximum of combinations with a limited number of bells. After hearing Graduale 1 and 2, De Doelen programmer Neil Wallace asked for two new works in this series. In Gradual 3 the same scale is used in a process in which the three top voices gradually draw closer to each other. 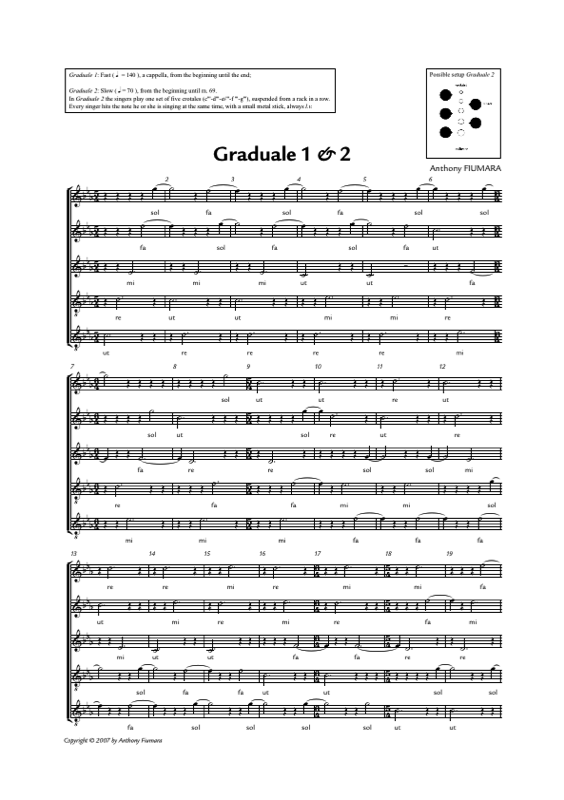 Graduale 4 is a kind of procession that recalls the 7 Interludes – related vocal works that I wrote a year before. The Graduales can be performed separately. Graduale 1-2: September 21, 2007, in Instutut Néerlandais, Paris by Compagnie Bischoff. Graduale 3-4: March 14, 2009, Festival Red Sound Rotterdam by VocaalLAB Nederland. The two new, small Graduales by Anthony Fiumara were striking: systematically permutating and succint of tone. The solmisation words (‚ut-re-mi-fa-sol’) reminded of Glass. And the little bells made the milder Graduale 2 a Pärt-like experience. VocaalLAB excelled In Graduales I-IV, serene sound poems [...] in which the tone repetitions reverberated against the heavenly arches of the Grote Kerk; meditative as in Tibetan cloister.